REACH has members who are vigilant of any damage happening on heritage and member Jayakumar, a teaching faculty of Kalakshetra was fast enough to inform us the heavy quarrying happening in and around Pudukkottai. Dinamalar the Tamil vernacular was the fastest to respond to our call and published the article the next day. See here. Times of India carried an article the next day . Thanks to our member Jayakumar who brought this to our notice, with his help we could appeal to the state minister for Archaeology, Shri. Thangam Thennarasu, in person (our PRO Chandra waited outside his office for almost 2 hours to deliver the letter in person) and gave news to these dailies. Ironically, in the same page of Times of India, just below the Pudukkottai quarrying article, there is another article which says ASI is documenting all rock-cut caves. Thanks but the irony is the most bombed rocks are from Pudukottai and Madurai regions, which claims most number of caves to exist as documented by ASI!! The Tamil edition of The Sunday Indian - magazine run in 14 languages by Shri. 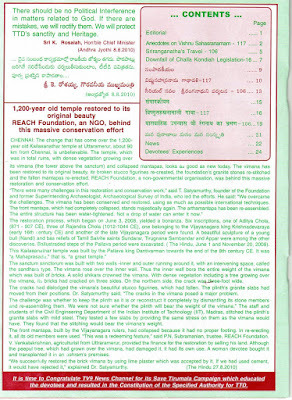 Arindam Choudary, has brought out appropriately the 20 September 2010 - 3 October 2010 edition as a 1000th year of Big Temple special edition, devoting most of the pages including the cover page for celebrating the 1000th year of consecration of the tanjavur Rajarajeswaram alias the Big Temple or the Brahadeeswara Temple.Those who can read Tamil enjoy! Other please excuse. The cover has a moon lit Big temple with snippets of article titles at the left hand top where Dr T Satyamurthy's photo appears. 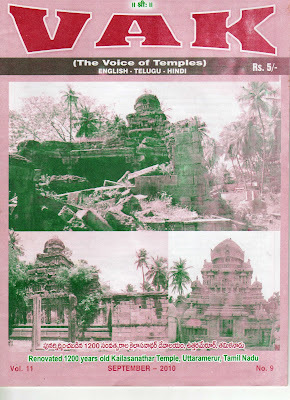 VAK which is also known as VOICE OF TEMPLES, a magazine run by the renowned Visa Balaji @ Chilkur Balaji temple trustee Soundarajan and his illustrious son Shri. Rengan fights for the upliftment of lives of temple priests as well as reports on any heritage conservation efforts. They are a powerful media as far as Andhra is concerned and it was a pleasant surprise when Shri.Renganji contacted REACH to allow them to publish our Uttaramerur temple story published in THE HINDU dated 27.08.2010 again in VAK. Happily we agreed. This caught the attention of the young and energitic HR&CE commissioner of Andhra Pradesh Government and our founder Dr. T.Satyamurthy was invited to Hyderabad for discussing and taking his advice on renovation of dilapidated temples in Andhra and avoid another Kalahasti like catastrophe. The engineers and executive officers of all districts were called for in the meeting and our power point presentation on heritage conservation was well received. The next move by the Commissioner was to request REACH to prepare a conservation manual which explains all types of conservation practices, to be followed by the engineers henceforth. We are in the process of preparing the manual and this will become the rule book for the HR&CE engineers in A.P to follow. Indeed a positive step by any Government and proactive too. While blaming many a governments for negligence of heritage temples, we should give credits to the incumbent commissioner for his fast action and decision.